Quality hardwood always brings a handsome touch to the decor, and now, you can get that rustic look in the bathroom with the Roper Rhodes Traditional Walnut Toilet Seat With Soft Close Hinge. 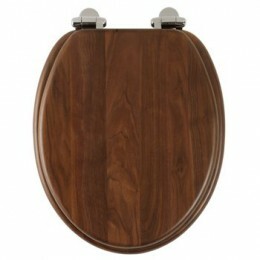 Constructed out of durable walnut wood, the toilet seat has a rich, dark finish that will bring warmth to your decor. The seat is designed to show off the grain of the wood, giving it wonderful patterning all across is surface. Since no two pieces of wood ever have the same grain, your toilet seat will be truly one of a kind. The Roper Rhodes Traditional Walnut Toilet Seat With Soft Close Hinge will complement many different styles of decor. Let it deepen an earth tone theme or use it as a bold finishing touch amongst pastels. Neutral enough to go with anything, the dark wood finish is flawlessly stylish in any setting. The toilet seat is even enhanced with soft close hinges to ensure you never disturb the household when you lower the seat. © 2019 Toiletseatz.co.uk. All Rights Reserved. Design by FCT.